This is a stunning image of the Milky Way! The image takes in the sky if you could temporarily remove the Earth or was at a good distance away from our planet. The image is the result of taking 3000 images of the night sky and stitching them together. Many features of the night sky that are too dim for the human eye to detect are represented in the image. 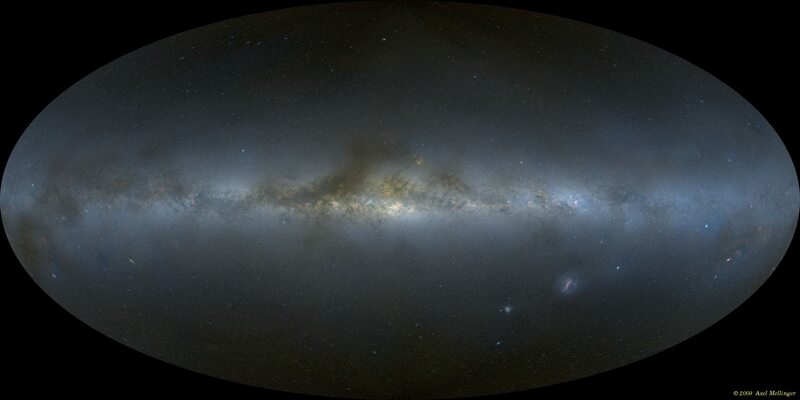 Particularly evident are the dark regions associated with gas and dust in the plane of the Milky Way. The Large and Small Magellanic Clouds are also distictive in the image. If you are interested in the details of how this image was produced there is a paper available on the All-Sky Milky Way Panorama 2.0 website. The website also has a zoomable image version of the map.